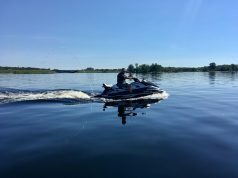 If you think that personal watercraft (PWC) have never been better — more affordable, more powerful, more reliable, better equipped — you are right. I should know since my career as a boating journalist has run more or less parallel to the growth and development of the personal watercraft industry. I’ve had a front-row seat as various PWC brands and models have come and gone. 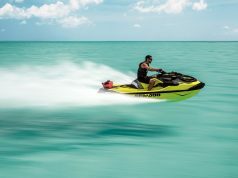 Kawasaki’s stand-up Jet Ski had been around since the early 1970s and is still available to enthusiasts as a 2018 four-stroke SX-R model. But the sit-down machines first introduced by Yamaha and Bombardier in the late 1980s really kick-started the PWC industry. That’s when I came in. Yamaha’s WaveRunners and Bombardier’s Sea-Doos were the early leaders, but Kawasaki was quick to adapt and expand its lineup. Today, those three manufacturers are the lone survivors of the past three decades, still developing and building PWC. Well-designed and well-built personal watercraft, for everyone from young, agile first-timers to more mature and experienced riders, have sold well through economic downturns and more stable times. In recent years, as sales threatened to stagnate, PWC builders introduced more affordable models for a new generation of riders. Mainstream boatbuilders have not yet found a similarly profitable formula for building and selling “starter” boats with the same kind of appeal. A new 60-hp PWC today costs less than a 60-hp outboard motor (boat not included). A well-equipped 90-hp PWC on a trailer costs less than a 90-hp outboard (boat and trailer extra). That said, simply building and marketing pretty good PWC has been no guarantee of success. Manufacturers that have come and gone include Wet Jet (owned by a ski-boat builder before being phased out), Tiger Shark (an offshoot of snowmobile and powersports builder Arctic Cat), Honda (whose 200-hp AquaTrax F-15X was very fast) and Polaris (still building snowmobiles, ATVs and motorcycles). Even Kawasaki, Yamaha and Bombardier (now BRP) had many models that failed to connect with enough buyers. The Kawasaki SC, for instance, a weird two-person side-by-side in early 1990s, didn’t catch on. In that same era, strong support for the Kawasaki X-2 — a relatively tippy water-bike with its own PWC racing division — encouraged Bombardier to build the Sea-Doo HX and Yamaha to bring out the WaveBlaster. All are long out of production. Sea-Doo’s convertible 3-D model also failed to connect. Monster four-person PWCs, including the Sea-Doo LRV, Yamaha SUV 1200 and Polaris Genesis, appeared briefly in the early 2000s. Owners still love them and keep them running, so don’t be surprised if they make a comeback. Compared to many models from the past, today’s luxury-class PWC — designed for fast, comfortable day-cruising but also capable watersports tow-boats — are paragons of design and construction, powered by clean and efficient four-stroke engines. 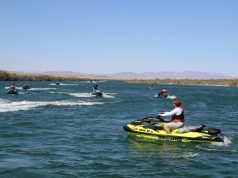 They have plenty of appeal for riders moving up from Yamaha WaveRunner EX series, Sea-Doo Spark or GTS, or Kawasaki Jet Ski STX-15F “starter” machines. Personal watercraft are on a roll these days. But if the last three decades are any indication, there will likely be more developments, a few false starts and many more successes. Previous articleNorthwest Territories: The True North Strong and Free!